Lollar's flagship pickup and an industry standard. 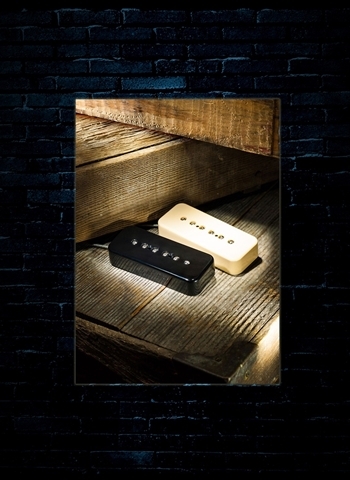 This pickup is scatter wound with de-gaussed Alnico 5 bar magnets, giving you a fat, clean tone with a smoother treble making it ideal for harder, driving rock with more grind. It sounds like an old P-90 rather than a new pickup with hard edges. The neck and bridge volumes are nearly equal when playing chords, with the bridge sounding slightly hotter when playing single notes. Pickups can be purchased separately or in matched two or three piece sets. RWRP sets for hum-canceling operation with single conductor and braided shield lead wire. Available with black, cream or white covers.